Walk through a unique store that takes you back to old Hawaii. A store that features new and vintage Hawaiiana, collectables of all sorts, vintage aloha shirts and barkcloth, vintage light fixtures and lamp shades. We also sell new and antique furniture, local and imported crafts, soaps, books and stationary. Everything one might need to make a home with a tropical twist. But don't take our word for it, read what the New York Times had to say about us. 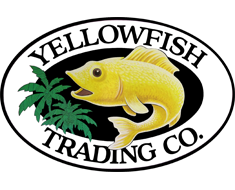 Yellowfish Trading Company was established in 1993, right after Hurricane Iniki, when there was a huge need for furnishings and home decor. Please come in and explore the store for yourself. If you need more info on anything you see on the website call us at 808-826-1227. Yellowfish Trading Company is located behind BARacuda in the 2-storey redwood building at the Hanalei Center, the shopping complex on the mountain side of Kuhio Hwy. For a map, click here. We are open daily from 10am till 8pm.